RoboSavvy Forum • View topic - Would you like a HAND? Would you like a HAND? That looks awesome, I for one am very impressed if it is to have independent fingers. 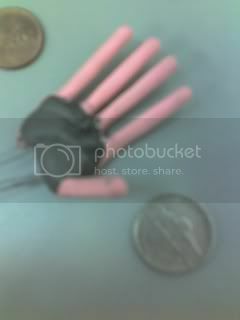 Bullit wrote: Yeah the shadow robot hand is very cool. It uses air muscles. I saw that a while ago, very cool indeed! Its been awhile. I have been lurking but not posting. I have finished a more compact prototype for my Hand project. The next step is to draw up the parts for producing a mold so that I can cast the pieces in a very light material. Also I have waited until I had a base unit to display my wares upon and I was just able to purchase my very own Robonova-1 for the modest price of $750.00. This means that I shall be spending a bit more time with you all and that I will post images of the Metamorphasis of my very own robotic competitor. The following images were created here at work using my cellular phone so they are of barely acceptable quality. Please leave your thoughts. I do so enjoy them. I will be blessing my machine with dexterity as soon as I've modled up the arms and adjusted the parimiters of my created hands to the point that I feel they are asthetically and mechanically sound. "Somnium est ubi nos ipsi primas agimus partes"
"There is a dream we are part of." Fantastic, is the plan still to use air muscles to control it? I had thought of something similar myself using those tiny pager motors mounted in my Manoi's arms. Direct servos first. Then maybe I'll be able to pursue my hydraulic muscles. The Manoi is a beautiful design. I can't figure out why no one has designed working hands yet. These are HUMANIOD robots after all. Having hands is one of our most distinguishing assets. My Robonova should arrive any day now. By the time I've finished with it, it will not be recogniseable as a RN-1. MYKL wrote: The following images were created here at work using my cellular phone so they are of barely acceptable quality. 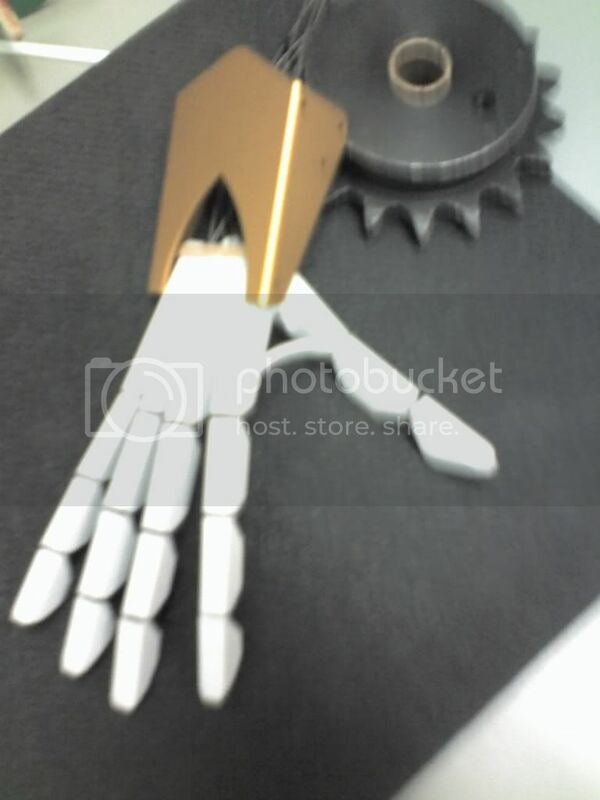 Those hands are simply amazing, is there a way to integrate them into a Robonova? If there was I would buy them in a second. This weeks end I tested which adhesive and skeletal parts I will use on the final version. The parts list consists of light weight hobby shop materials. My next set of pictures (Hopefully by the end of this week) will be of my standard RN-1 modded with at least one working hand. My brother has a nice video camera and knows how to do the You Tube thing so I'll post a video too if I can talk him into it. It would be really fun to produce a kit but I won't bother with it unless there would be enough interest to warrant the time I'd spend on making it very user friendly. I produce manufacturing Drawings/Models/Instructions for a living so I will be able to make very helpful drawings. If I do the kits I'll probably sell them in bags like when you go to the hobby store to buy upgrade parts for your R/C vehicles. I am working on a Robonova with a 3.5" core 2 duo pc for a brain on the front and a I-droid head. I want to use the new style Baur Mech double knees to make a set of double elbows. With the Hands that you have it would be an excellent astro boy in the making. I would for sure buy a set of the hands in any form. Have you posted any pictures of your intent/creation? It sounds a bit like where I am going with my RN-1 project. I am lost as far as control. I am a mechanical designer, the electrics are still a bit daunting to me. Its the user friendly GUI that moved me to purchase the RN-1. 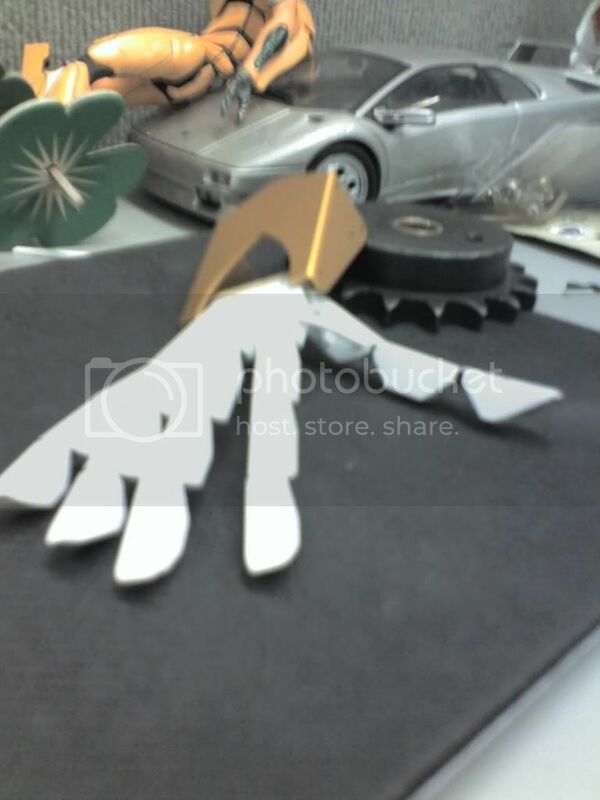 Its shown in the pictures next to the forearm braket of a Robonova-1 for size comaprison. This version is just the skeleton. I mean to flesh it ouut a bit more and make the movements a bit more fluid. I don't know if I'll add this one to my RN as it seems to be a bit large. I may just post a few assembly pictures so that you could make your own instead of bothering with a kit. Will the hand basically open and close from a servo? or is there a way to use it without using five servos per hand. I want to create a fully autonomous humanoid robot. Basically now I am getting into some kind of Sherline CNC machine so that I can experiment with different kinds of brackets and torso types. I feel that striking the right kind of balance in the frame is the key. The 3.5" by 5" core 2 duo mother is available and then I just need to more or less develop a good li-pol battery system. Something that will get six to eight hours of use, before the need to charge. Then I am going to work on the personality. The basic robonova system has the most potential to me, it is just a matter of bringing it to complete fruition. Each digit has a control line. If I wish I can attach them all to one servo or I can seperate conrol of each didit with five servos. On the RN-1 I will probably have a servo for the thumb, one for the first finger, and one for the other three. I think a kit is a great idea, but can't decide which version is the most fantastic, the first or second. I think offer both as kits, the first one is smaller for use on smaller humanoids such as i-SOBOT and the second one is larger for Robonova and larger robots. This is a well developed hand, and a wonderful innovative idea for marketing a kit in each version. Be sure and offer the kit with two hands! 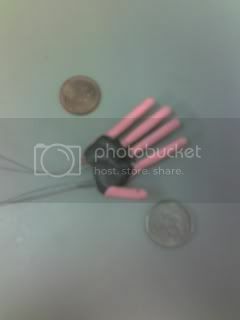 There's miniature servos that are ideally suited for the purpose of driving these hands. One I had the DOF to the legs and arms that I wish to I'm sure the overall 'bot will be a bit bigger so a larger hand may fit the overall scheme. I was not given enough free time this weeks end to create. I'll probably have a new set done by the next. Thank you for sharing your thoughts. They are very encouraging. What makes the fingers swing back to the open position?